Missy Pfohl Smith is the Artistic Director of BIODANCE and the Director of the Program of Dance and Movement at University of Rochester. She received her MFA from Sarah Lawrence College and her BS from The College at Brockport. She has taught and performed across the US and abroad with BIODANCE, Randy James Dance Works, Paul Mosley, among others. 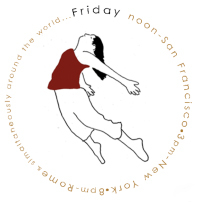 BIODANCE, established in 2002, is a repertory company that performs the work of Smith, Heidi Latsky, Bill Evans, D. Chase Angier, Ivy Baldwin, Jeanne Schickler Compisi, Courtney World and more. Smith enjoys collaborating with multi-disciplinary artists in music, visual art, sculpture and technology and she is currently working on a BIO/Dance and Social Justice Series to be performed in various community venues in Rochester, NY. Her areas of interest include choreography, site specific performance, improvisation, socially conscious dance work and dance on camera. Danced with The Wondertwins, who are guests here today for a hip hop workshop from 2-3:30pm and a performance later this evening!